In addition to quality service and robust insurance coverage, we're offering a little something extra to our new clients this month. 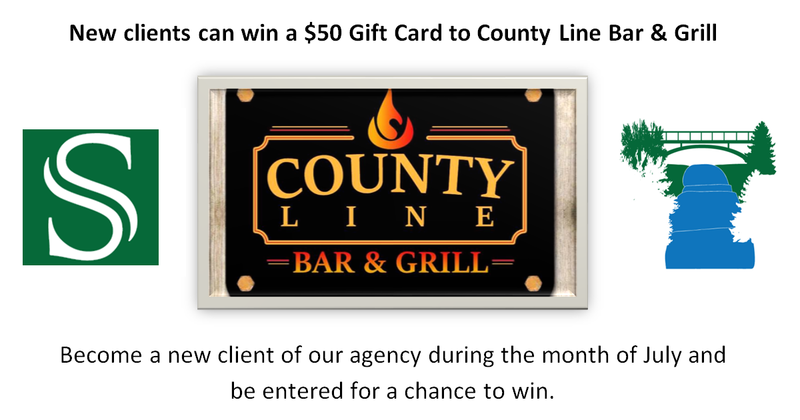 As a part of New Client Appreciation Month, all of our new clients during the month of July will be entered for a chance to win a $50 Gift Card to County Line Bar & Grill. If you've been thinking about taking your insurance needs to a trusted independent agency like Sidle Insurance; you can get a free insurance quote right now! It's our specialty to provide thorough insurance coverage. We look forward to partnering with you to create a dependable insurance strategy that caters to your needs. We appreciate and thank you for being a member of the Sidle Insurance family. It is our hope that your experiences with our agency will encourage you to invite your friends and loved ones to try our services as we welcome our new clients with the same impeccable service and competitive prices that we've sought to provide you. If there is anything we can do to improve your insurance experience, please let us know. You can give us a call at (607) 535-6501 or visit our office at 219 S. Catherine Street in Montour Falls, NY. Details about the contest can be found on our Facebook page.